The most worry some problem of all times and especially of today’s generation is dark circles because you have to work day and night, spend long hours in front of a computer, bundles of tensions, not a healthy diet and many more things that enhance this worse problem. You can minimize them by putting on layers of makeup or by beauty treatments like facial. Happy news for beauty conscious is that you can get rid of this long age problem in just two weeks, unbelievable. Yes! You can have spotless skin without dark circles by using by using Dore Aesthetics dark eye circle removal treatment. But if you don’t want to go for a treatment, try these home remedies. You have all these things in your kitchen cabinet. 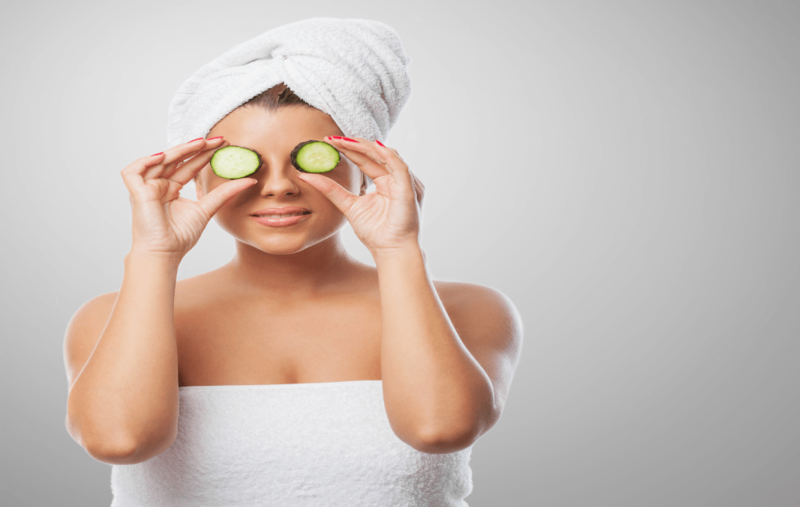 Cucumber is known for its calm and cool impact due to its mild astringent and skin fairness characteristics. Follow the directions and get flawless skin within days. Take a fresh cucumber and slice it. Place it in the fridge for half an hour. Lay down in a comfy place and put the cooled slices on your closed eyes with happy dreams of fair skin. After fifteen minutes wash your face with fresh water. For better results try this two times a day for two weeks. Practice this treatment for ten days. Mix equal portions of lemon and cucumber juices. Apply this with cotton swabs on your skin around your eyes for fifteen minutes. Wash it away with freshwater. It is a natural skin toner with mild astringent traits that help to refresh your eyes along with the property of lightening the skin tone. For five weeks continue this treatment. In a bowl add some rose water and dip in small cotton balls. Place these wet cotton balls over your closed eyes for fifteen minutes. Due to the miraculous properties of apple cider vinegar, it is known as a poor man’s beauty doctor or dermatologist. It cures almost all of the skin issues from which every other person is suffering these days. It helps to regain your skin tone. In addition to its refreshing quality, it helps to achieve the desired glow and gives you your desired results. It will work wonders on your skin, and you will refuse to accept that it is your skin. Try once and experience the outcomes on your own. Tomato works like bleaching powder. It lightens yours under eye’s skin complexion. Combine equal portions of lemon and tomato juices and spread the mixture with the help of small cotton balls around your closed eyes and wait for ten minutes and wash with fresh water. Repeat this two times a day for two months. If you have some issues regarding lemon juice then simply apply tomato juice. You can get the same benefit by drinking a healthy and delicious glass full of lemon and tomato juice with some salt and mint leaves. Enjoy this refreshing drink two times a day for about one week. Almonds are very good for hair, skin and mental sharpness. Almond oil has the natural skin healing power. It lightens the skin tone naturally with the combination of vitamin E oil. Due to the presence of vitamin A, almond oil helps to prevent acne. It also cleans the pores of your skin. Mixed with crushed sugar, it can be applied as a facial scrub. Before going to bedspread a few drops of almond oil around your eyes while massaging. See the miraculous effects of almond oil after washing your face the following day. Continue this remedy till you get rid of your black skin under your eyes.